Copenhagen Chamber Enselble (Københavns Kammerensemble) was founded in 1978 and closed down in 2014 after 36 years of existence. Its members were three old friends from The Copenhagen Choir School, who had pursued widely diverse careers, a Polish violinist and a cellist from Northern Sweden, both of whom with solo positions in leading Danish professional orchestras. The harpsichord player is still working as an internationally well known choir conductor, the oboist was soloist in The Danish Radio Symphony Orchestra, while the flute player , rewarded with the Mozart medaillon for his work in the international music field, was a professor of law. The violinist played in Copenhagen Philharmonic Orchestra, while the cellist was solo-player in The Royal Danish Orchestra. The group reflected the combination of tradition and versatility which has always been a characteristic of the musicians who have formed the musical life of Denmark. The ensemble specialized in both baroque and contemporary music. They were playing Vivaldi, Telemann, Bach, Handel, Boismortier and the Scandinavian baroque composers Roman and Scheibe - and new Scandinavian music, written for us by composers like Leif Kayser, Erik Norby, Niels Viggo Bentzon, Jan Maegaard and Sven Erik Werner (Denmark), Thorkell Sigurbjörnsson and Mist Thorkelsdóttir (Iceland) or Oddvar S. Kvam (Norway). Kayser-Nordal-Sigurbjörnsson. HCD 1007 (Helikon 1992). Contemporary Danish and Icelandic music. 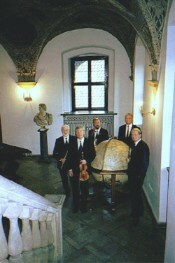 The Copenhagen Chamber Ensemble plays Roman, Scheibe, Telemann, Boismortier and Vivaldi. CLASSCD 480 (Classico 2003). This cd appeared in June 2003 and contains music of Scandinavian and European baroque composers. A cd with music by Ole Schmidt, Erik Norby, John von Daler, Niels Viggo Bentzon and Mist Thorkelsdóttir appeared in May 2008 (Classico 797). Sorö International Orgelfestival, Denmark, in August 2005. Puerto Rico and U.S. Virgin Islands (Danish Westindies), January 2006. England March 2006. (London and Bognor Regis). Arranged by The Danish Cultural Institute.